The combination of garlic supplementation and cardio training reduces blood pressure and boosts the concentration of 'good cholesterol' (HDL) in the blood. Iranian sports scientist Jabbar Bashiri discovered this. Bashiri divided 44 healthy men aged 20-30 into four groups. Two groups took two capsules a day containing 500 mg garlic extract. One of these groups did no training; the other group ran on a treadmill four times a week. In the four weeks that the experiment lasted, Bashiri gradually increased the length of the training sessions from 30 to 45 minutes, and increased the intensity from 60 to 75 percent of maximal heart rate. Two other groups were given a placebo. One of these groups trained; the other did not. The combination of garlic supplementation and training resulted in a significant increase in the amount of 'good cholesterol' HDL and a significant decrease in diastolic blood pressure [DBP]. Training alone and training + garlic supplementation both reduced systolic blood pressure [SBP]. TG = training + garlic supplementation; G = garlic supplementation; TP = training + placebo; P = placebo. The men did not lose weight. This was probably why their 'bad cholesterol' (LDL) level and triglyceride concentration did not decrease significantly during the experiment. In animal studies garlic supplementation has been shown to boost the widening effect of NO on the blood vessels [Clin Exp Pharmacol Physiol. 2000 Oct;27(10):780-6. 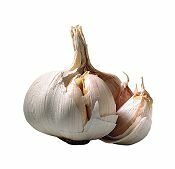 ], but components of garlic have also been shown to have a direct effect on widening blood vessels. [J Pak Med Assoc. 1985; 35(12):357-62.] Making blood vessels more supple lowers blood pressure. Physical exercise also makes blood vessels more supple. So apparently the effects of physical exercise and garlic reinforce each other. So how does the combination of physical exercise and garlic result in a higher HDL level? Bashiri doesn't know. "Based on the findings of the present study, it is concluded that garlic supplementation along with exercise training might have additive effect on blood pressure but not lipid profile", the researchers write. "Future research should investigate the efficacy of this combined intervention over a longer duration. Moreover, further studies are needed to determine the effect of this combined intervention in other populations such as hypercholesterolemic and hypertensive patients." Zahedan Journal of Research in Medical Sciences 04/2015; 17(4). If you eat garlic regularly, your skin may stay young for longer. Korean research. The more leeks, onions, chives or garlic that men eat, the less likely they are to develop prostate cancer. This study explains how. Garlic powder boosts testosterone production and reduces cortisol production.